There's a bit of pride when you watch a seed you had planted grow up to be a bountiful, delicious vegetable or fruit plant. What had started as the bare whisper of health to come was cultivated into a full-fledged kale plant, producing beautifully perfect leaves. Duc had started the kale seed long ago and then transplanted it in my parents' side garden where it flourished under the shaded sun. We had a large harvest recently so I had to think of a way to use it. 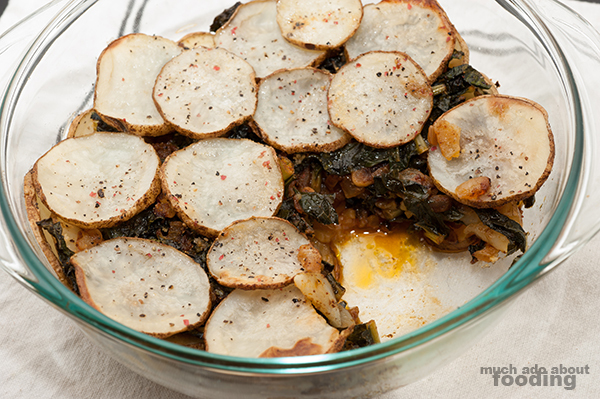 I sketched out a potato kale gratin whilst thinking one day and decided we'd make it! This dish is like a big bowl of comfort food, wholesome and healthful. I noted that it is breadless because a lot of gratins have added breadcrumbs and cheese on top but this one doesn't (though you can add if you'd like!). Preheat oven to 425°F. Chop up onion and slice garlic. Wash and chop kale. Heat a medium skillet on medium with a thin layer of oil. Add onion until nearly translucent; then add garlic, paprika, coriander, and ginger. Then add kale until wilt. 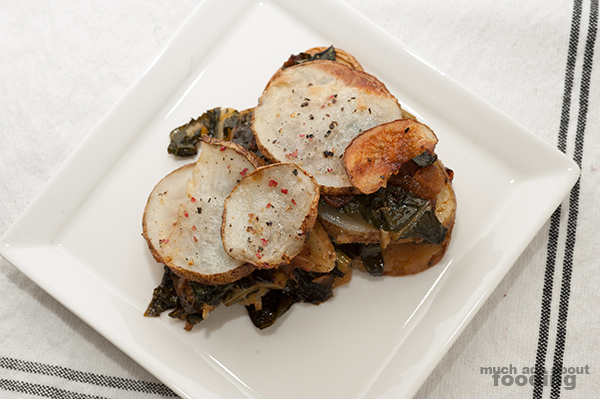 Thinly slice potatoes. 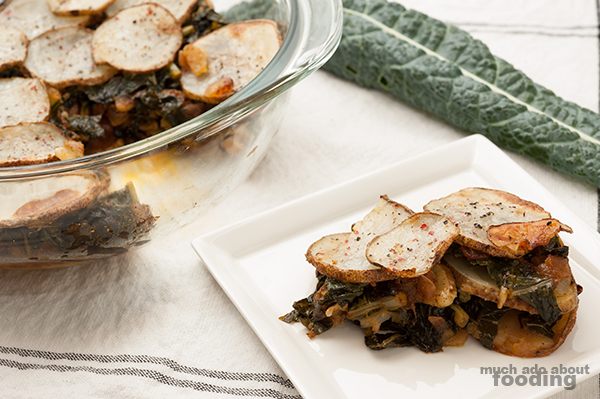 Layer potatoes in a 2-quart casserole, alternating with kale and ending with potatoes. Season between layers with salt and pepper to taste. Pour melted butter over entire gratin and place in oven for 35 minutes. Let cool and enjoy!